Some say it’s one of the most beautiful places in the States, and with good reason. Yellowstone National Park consists of almost 900,000 hectares of lakes, canyons, rivers, ranges and some pretty wild geothermal action with a generous side of grizzlies, wolves, bison and other creatures. On its eastern edge, where Montana borders Wyoming and about 50 kilometres from Old Faithful Geyser, you’ll find this glorious campsite. You can choose from a variety of tents; take the suite option and enjoy your own indoor bathroom with freestanding tub, timber deck and wood-burning stove all in a secluded location with uninterrupted views of the landscape. During the day you can choose from a range of activities, from horse-riding to hiking, fly-fishing to mountain-biking, all of which can be organised by the hosts. 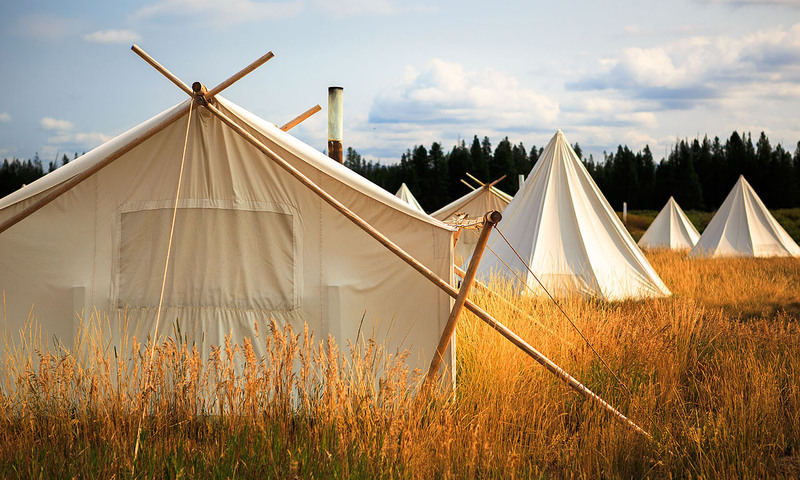 Yellowstone Under Canvas is located on the Bar N Ranch. As you enter West Yellowstone you will come to a signal light at the intersection of Highway 191 and Highway 20. Turn right at the signal and drive towards Ashton. About eight kilometres from town you’ll cross the south fork of the Madison River. Continue driving and after about 1.6 kilometres you’ll see the log arch for the Bar N Ranch on your right. Turn right and follow the driveway for about 1.6 kilometres and you will see the lodge. Rates start at US$95 per night. Yellowstone Under Canvas is closed during winter, from September to May.